For a limited time (until our surplus stock has been sold!) we are offering a big discount for customers who are interested in buying a Petzl Zigzag and a Petzl Zillon together. Simply enter zigzill (lower case) into discount voucher code to get a chunky discount on both products. Already available are the Petzl Zigzag or ‘Petzl ZZ! ), a clever mechanical prusik, the successor to the original recalled version released in February 2013. Also just released onto the UK market is the arborist work positioning lanyard the Petzl Zillon; Available with a choice of 3 different rope lengths (2.5m, 4m and 5.5m). Due for release at some point towards the end of February / beginning of March are a new version of the Petzl Sequoia and Sequoia SRT harnesses, a shoulder strap option compatible with the Sequoia SRT harness, and also a separate expandable arborist seat, the Petzl Swing Seat (compatible with both Sequoia harnesses). 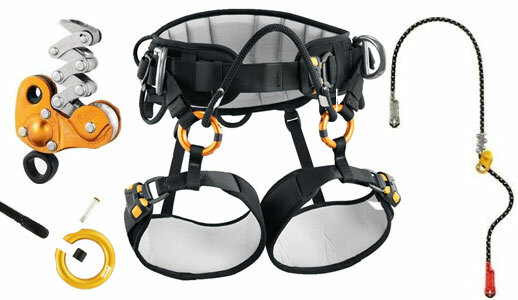 Spare parts and accessories for these arborists products include: Petzl Suspension Bridge and the multi-directional gated ring, the Petzl Ring Open.